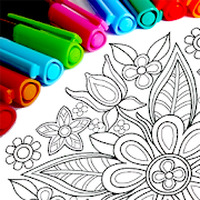 "100 pages of beautiful mandalas for you to color"
Game Goal: Mandala is a virtual version of the famous coloring books for adults. It offers over 100 models of mandalas with various levels of difficulty that guarantee hours and hours of fun relaxation. How to Play: Select the desired mandala and then tap the gaps you want to color with the chosen color. To share, select the camera icon and then the share button. Graphics: Many different designs and different brush options with bright and varied colors are available. Controls: With simple touches, you can color all Mandala spaces. If you use a small screen device, you can pinch the screen to zoom and color more accurately. Installation requirements: A minimum of 27.63 MB of free memory space and Android 4.0 or higher. Rating: The TOP 5 Most popular Apps in Kids Books category. Lets you share the paintings. The ultimate app for dinosaur lovers! A virtual library for young children!